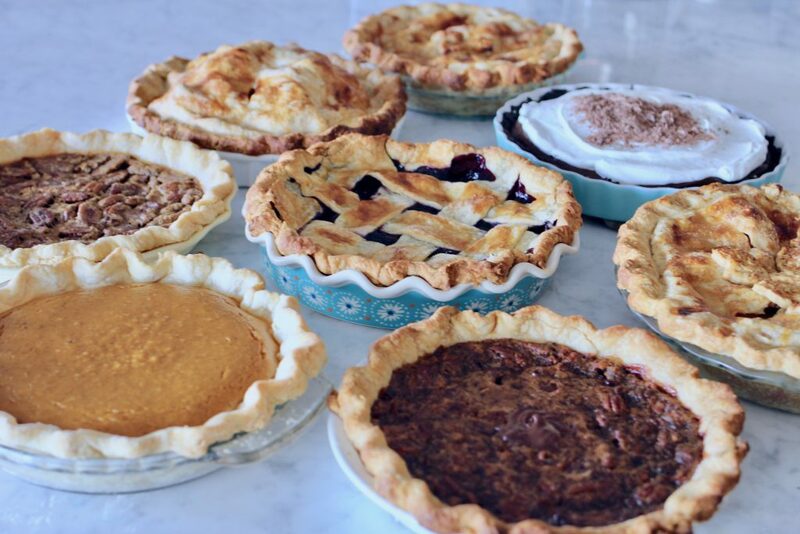 Oh, how I love pie. 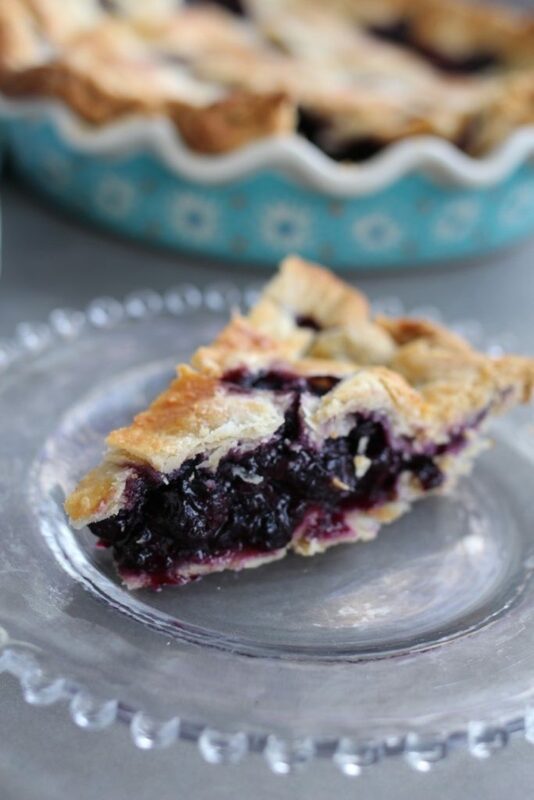 Bountiful Blueberry Pie is one of our family favorites. 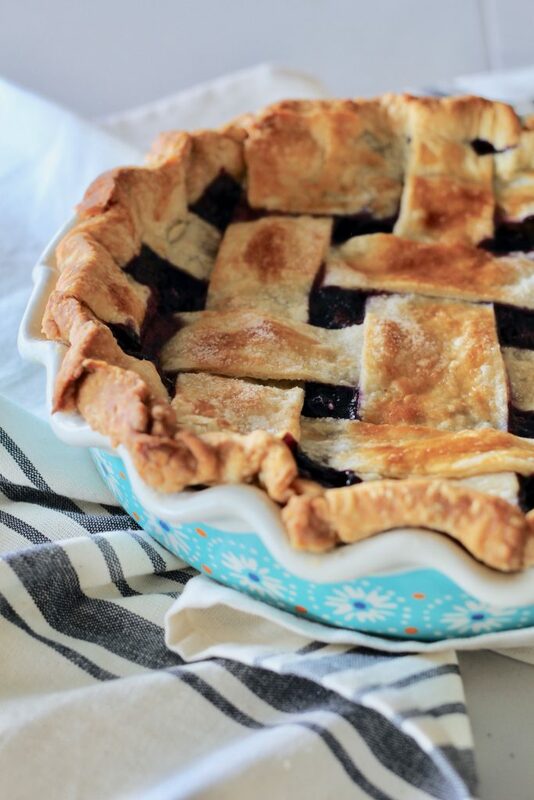 This pie is made with fresh or frozen blueberries and is simple enough for a beginner to put together! 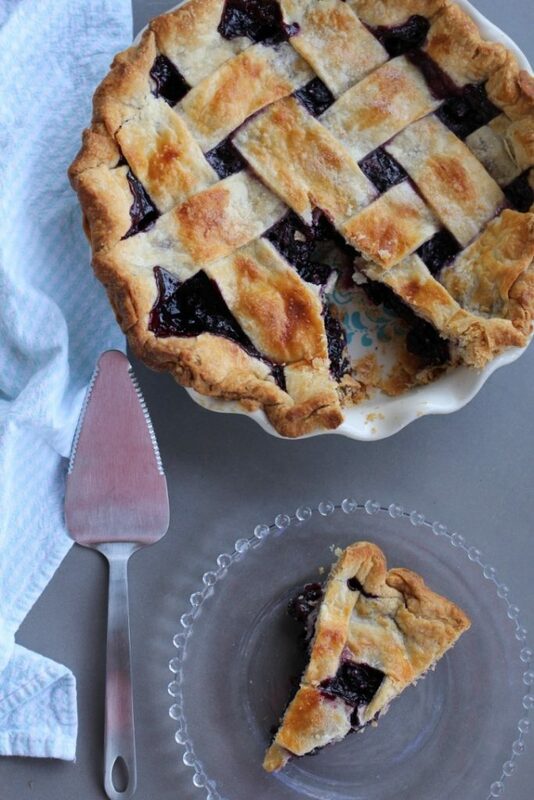 Blueberry pie is on the super-simple list as far as pie making goes. No peeling of fruit, or removing pitts or seeds. In this recipe, all you need to do is measure the berries, cook a portion of the berries to create a thickening for the filling, throw into the shell with a few other ingredients and about an hour later (along with some cooling and setting up time) , you have P I E.
One of my most important tips when making pie is to allow enough cooling time for the pie to properly set up. I’m not a patient person when it comes to baking and cooking. I want results FAST. but you can’t rush a good pie. The filling ingredients need time to cool down and also set up. 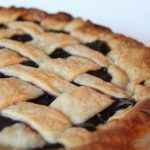 In this pie, the filling is all berries, so after the juices are released and combine with the sugar and tapioca to thicken the pie, everything needs to have time to settle before cutting into a pie. I’ve had many people tell me over the years their pies don’t turn out. When we talk about what happened, I find at least 50% of the time, they cut into the pie within an hour. Plan for the pie to sit at least 2-3 hours to completely cool and set up to avoid runny fillings! How easy is that? I’ve experimented over the years with fresh and frozen blueberries and have found frozen blueberries tend to yield a better tasting and less runny filling. I’m not sure why frozen berries taste better to me after baked up, maybe they seem more firm and I like the texture a little better than using fresh berries? 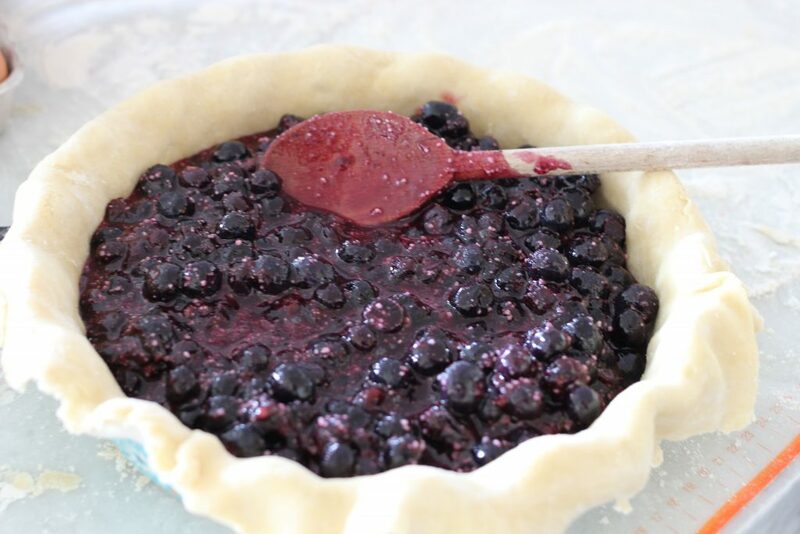 The beauty of using frozen berries is this pie can be made year round. Make sure to use the berries frozen and not thawed! 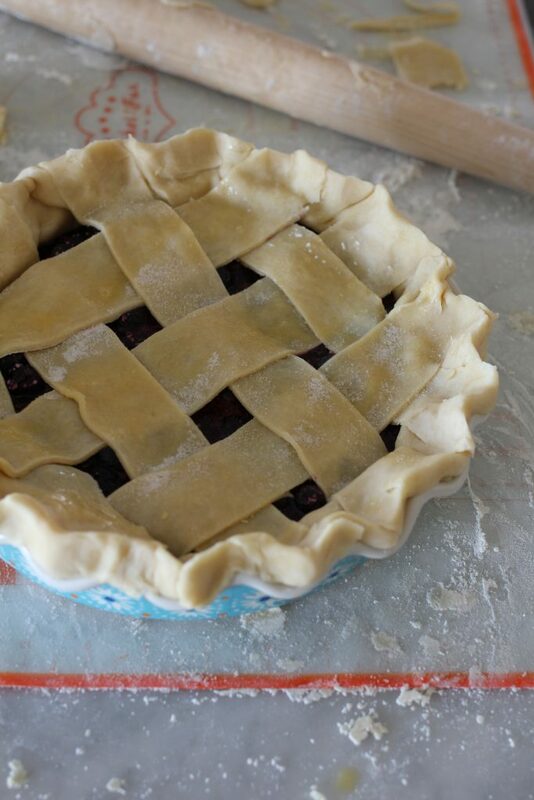 Dry tapioca is my favorite ingredient to thicken the filling of blueberry pie. It doesn’t leave a pasty taste in the filling and thickens the berry juice without making it congealed. In the photo shown without the top crust, you can see the filling exposed, and the dry tapioca is visible. When the pie bakes and all of the filling ingredients are heated in the oven, the dry tapioca is no longer visible. I know you’re going to love Bountiful Blueberry Pie! The simplicity of this recipe lets the blueberries shine as the main ingredient so you can enjoy every delicious bite. Make sure to read my full tutorial on the Best Flaky Pie Crust and how to bind bake a crust here. Happy baking! 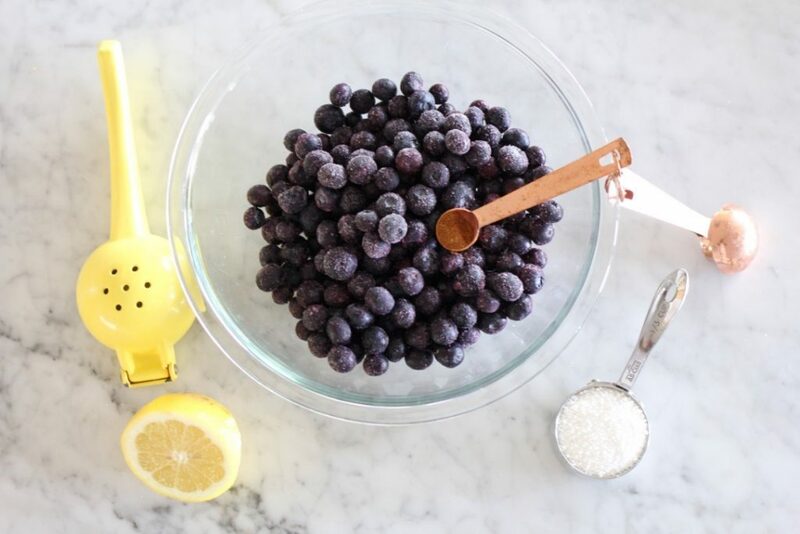 Place two cups of blueberries in a large heavy sauce pan with 1/4 cup of sugar. Using a potato masher, crush the berries and cook for about 5 minutes. Remove from heat. Add the remaining 4 cups of berries, remaining 1 cup sugar, tapioca, lemon juice, cinnamon. and almond extract if using. Cut into 11/8 inch wide strips that are at least 10-inches long. Using a ruler that is 1 1/8-inches wide, lay the ruler on the dough at 1 edge and roll across dough using the edge of the ruler as you go to cut through the dough.Lay 4 strips of dough across the top of the filling horizontally, leaving an even amount of space in between each strip. Fold back 2 alternating strips and lay down another strip in the middle of the pie, perpendicular to the other strips. Return the strips that are laid back to their original position. Next, fold back the other 2 strips and lay down a strip to the left of the center perpendicular strip. Return the strips that are laid back to their original position and repeat on the other side of the perpendicular strip, folding back the same 2 strips as you did on the other side. Once you have a lattice, brush all the strips of dough with the egg yolk, trim excess dough and pinch strips and edge of crust in order to seal. Place the pie on the bottom rack of the oven on top of a cookie sheet or sheet of foil to catch drippings and bake for about 1 hour 15 minutes. The pie should be bubbling lightly around the edges. If the lattice is not browned enough in the center, place under the broiler for 1 to 2 minutes. Watch carefully! Place the pie on a rack and allow to cool to room temperature before serving, about 2-3 hours. Is that "minute tapioca" or tapioca pudding or what exactly? Jane, Yes, I used Minute Tapioca. I will change the recipe to reflect. thanks! if using frozen blueberries, do you thaw and drain them before adding the remaining 4 cups?